The Danehill dynasty has made a mighty mark on Australian breeding, but it is 50 years since the real game changer passed away, his weary head in the arms of his handler, at Baramul Stud in the Widden Valley of NSW. He was Star Kingdom, who injected speed into the Australian thoroughbred, creating a line of precocious racehorses that laid siege to the elite juvenile events. Star Kingdom, by Stardust, a son of Lord Derby’s great Hyperion, from Impromptu, an unraced Concerto mare, was foaled in Ireland in 1946 and passed away in Australia in 1967. He was small, just a tick over 15 hands, but he cast a giant’s shadow when, at the finish of a racing career that included victory in the Gimcrack Stakes at York, he proved he was worth his weight in gold as a stallion. He was leading sire five times, leading sire of two-year-olds seven times, leading sire of broodmares three times. 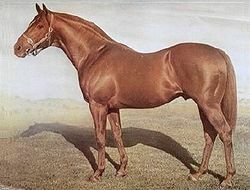 He sired the winners of the first five editions of the Golden Slipper Stakes at Rosehill and at various times his offspring held Australian records for races from four furlongs to 10 furlongs. Of 260 individual winners, 136 won at two. Biscay, Todman, Citius and Sky High were among his outstanding runners, along with Fine and Dandy, Noholme, Time and Tide and Sky High. Then there is his daughter Dark Jewel, whose foals included Baguette, Cabochon, Heirloom and Birthright, variously winners of major stakes races, including a Golden Slipper. It is 50 years this year since they buried him at Baramul, but we remember him still because the breeding industry might have been very different without Star Kingdom. He energised the sprinting segment of Australian racing, gave owners quick returns on their investments, and left mares that eventually enhanced the entire sport.